I like that the casino is right there rooms were clean and nice . The room was Clean. The Bed was comfortable. Check in was very easy! 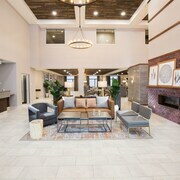 Where to find Prince George hotels near an airport? 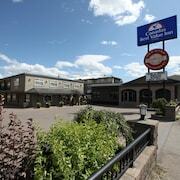 Where can I find hotels in Prince George that are near tourist attractions? Stop and see a full array of attractions in Prince George, from parks and museums to restaurants and art galleries. While Prince George sees a lot of through traffic from road-trippers, this town is no ordinary road-side attraction. With excellent museums, festivals, restaurants, and incredible opportunities to reunite with nature, you’ll want to slow down and fit Prince George hotels into your budget. Looking to pack some adventure into your holiday? 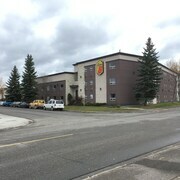 Search for hotels in Prince George near Fort George Park. This spectacular park has everything – a bit of history, a chance to enjoy a stroll, and attractions for kids of all ages, like the Little Prince Train, Rotoract Spray Park, and Rotary Playground. Looking for local museums? The Exploration Place, a museum and science center in Lheidli T'enneh Memorial Park, is a great place to bring the kids. Don’t forget to check out the many other galleries and museums in the park as well, including the Prince George Hall of Fame Museum and the First Nations Exhibit. On your Prince George holiday, why not take some time to get to know the culture a little better? Prince George is still a lumber town at heart, so don’t forget to wave to Mr. P. G., the official town mascot made of logs as you drive around town. Or, visit the Prince George Railway and Forestry Museum. 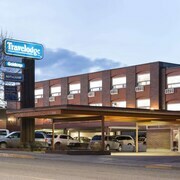 Book Prince George hotels near restaurants and the many art galleries to experience both the culinary and visual arts. 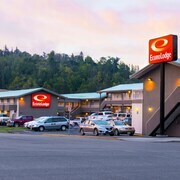 Whatever your plans for Prince George, it all starts with getting great deals on accommodations, flights, and car rentals. Book today at Expedia.ca and leave some green in your wallet! 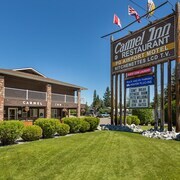 Are there hotels in other cities near Prince George? 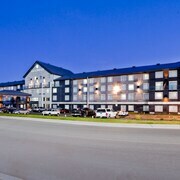 What other types of accommodations are available in Prince George? Explore Prince George with Expedia.ca’s Travel Guides to find the best flights, cars, holiday packages and more! Flights from Edmonton Intl. to Macdonald Cartier Intl. Flights from Edmonton Intl. to Portland Intl. Flights from Nanaimo BC to Pearson Intl. Flights from Nanaimo BC to Calgary Intl.